Last week we blogged about our new Romeo and Juliet textbook and how it scaffolds students to read and actually understand the play at a language level, not just a plot level. Apart from its usefulness as a reading resource, our Romeo and Juliet textbook also guides students through how to write on the play. 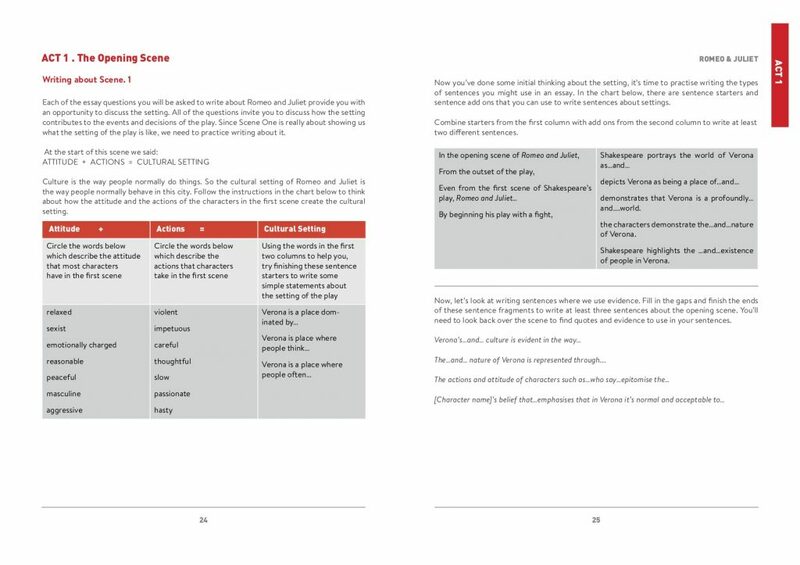 Unlike normal school editions of Romeo and Juliet which feature ineffectual and boring plot level comprehension questions at the end of each scene, our edition gets students to do something more challenging, interesting and useful: practise writing about the scene. Below is an example of a typical end scene writing activity. Each of these writing activities articulates to students why they might need to write about this scene in an essay, what that writing would look like and then scaffolds students to write about the scene themselves. Writing activities like this make for both a great in class resource as well as highly effective homework activities. To find out more about our new textbook or just to find out some great ways to approach and teach Romeo and Juliet, come along to our upcoming Romeo and Juliet book launch and workshop (Ringwood details here and Northcote details here).